Besides going to an island that is full of clown figurines, perhaps the most bizarre place you could visit is an island that features dolls hanging from the branches of overhead trees in various positions. Though the first island may not exist at the moment, the latter does just south of Mexico City – the Isla de la Munecas. The story behind the Island of the Dolls is a sad one. To be certain, the Isla de la Munecas never really was created to become a tourist destination. According to the story, a little girl was found on this island, drowned under what can only be described as “mysterious circumstances.” The hundreds of dolls that inhabit the trees of the island are said to carry this poor lost soul’s spirit. There are many tales that are reportedly first hand accounts of unusual events that have happened to people on the Island of the Dolls. It is routinely said that people can hear the dolls whispering to each other up in the trees. Sailors have reportedly said that they have felt unusual yearnings to visit the island when they have been sailing by it. Local legends say that the dolls can move their arms and legs, roll their eyes at people, and even turn their heads to stare blankly at a visitor to the island. The caretaker of the Island of the Dolls lived a pretty solitary life. He was rarely seen by others and rarely even left the island. The story of finding the little girl came from the caretaker and as he described it, he did his very best to save her life and failed. Days later, he found a doll that had washed up, so he hung it in a tree to respect the spirit of the little girl that he couldn’t save. There are many who believe that the caretaker made up the story of the little girl because of the insanity that loneliness can cause. As the caretaker became haunted by images of the little girl in his dreams, he felt like he hadn’t respected her spirit enough. To calm his own spirit, he began to hang more dolls in the trees so that he could appease the little girl’s spirit so she would stop haunting him. Doll after doll he would hang, but night after night, the caretaker would be haunted by her image once again. The caretaker, whose name was Don Julian, did this over a period of 50 years. In 2001, he was found drowned in the same spot where he claimed that he had found the little girl. Since then, people have often visited the Isla de la Munecas to experience the dolls and the girl’s spirit for themselves. At minimum, you will need to plan for at least a two hour boat ride to arrive at the Isla de la Munecas. You can also choose to explore the canals that surround the area south of Mexico City and that will often double the time it takes to arrive at the island. You will need to take a boat there to see the island. The major ferry lines in the area do not service the Isla de la Munecas. You will need to ask boats in the area if they can either take you there or have the island on the agenda. Plan for a fee of at least 200 pesos for the trip. Many people find that they have luck taking a ferry from either Embarcadero Cuemanco or from Embarcadero Fernando Celada. Make sure to ask about how long the actual boat ride to the island will take – some boats require a six hour journey to get there. 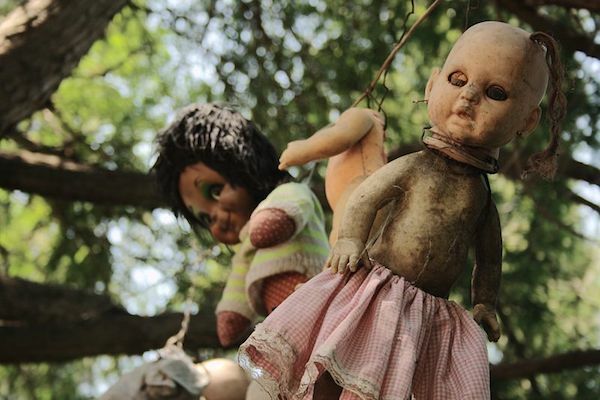 The Island of the Dolls might be out of the way, but it is definitely one of the most bizarre tourist attractions to see anywhere around the world. Will the dolls speak to you? Stare you down? Roll their eyes at you because you’re “just another tourist?” There’s only one way to find out!